Earlier this week I showed you some ways to add utility to iTunes via AppleScript. Since it’s Friday, today seems like a good day to show you how to have a little fun with your iTunes library. I’ve always enjoyed the play-at-home version of Name That Tune, even though I’ve often found it to be relatively easy—as a music nut and a former college-radio DJ, I can pick out most of the 8,000 tracks in my iTunes library fairly quickly. 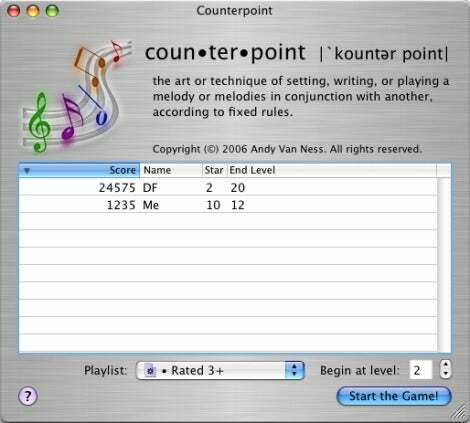 But Andy Van Ness’ Counterpoint 1.1 ( ; free) is a new twist on the classic game, and one that makes identifying songs much more of a challenge. You see, instead of naming just one tune, you have to name multiple tunes—all playing at the same time! What exactly do I mean? Each round of Counterpoint involves listening to a layered mix of tracks from your iTunes library: one track in the first round, two in the second, three in the third, and so on. When starting a game, you can choose to limit tracks to a particular playlist; so, for example, you can play the game using only higher-rated (read: your favorite) tracks. (You can also choose to start at a higher level if the early levels are too easy for you.) Counterpoint then randomly picks the appropriate number of tracks from the chosen source and plays them back simultaneously, one on top of the other, and challenges you to identify each. During each round, the left-hand side of the Counterpoint window lists possible tracks and their artists; when you figure out a song, double-click it (or select it and click on Answer). Assuming your guess was correct, the track is moved to the Already Guessed Songs list and—thankfully—removed from the cacophony. This continues until you’ve identified every song in the mix, thus ending the round. Counterpoint gives you a specific amount of time to complete each round, and awards points based on the round number, the time it takes you to complete each round, the number of tracks in the source playlist or library, and how many incorrect guesses you make. (The latter increases the difficulty because, for example, if you know you hear a Tom Petty song but you can’t figure out which one, blindly trying every Tom Petty track will cause you to lose points.) Thankfully, Counterpoint gives you plenty of time for each round; you’ll likely throw in the towel out of mental fatigue before you get to a round where you run out of time. Counterpoint is challenging, but it’s a lot of fun, too. Unfortunately, its interface for guessing tracks leaves a lot to be desired. For example, you can sort the track list by track or artist name and then scroll through the list until you find the desired song; however, if your library or playlist has thousands of songs, this process can be unwieldy. The game’s search/filter field looks like it might help, but its logic remains a mystery to me—the filtered/results list always includes items that appear to have little relation to my search term. The best I’ve been able to do is to type in the most unique word of the artist’s name, sort by artist, and then browse the resulting filtered list to find the desired track. A more-functional search box would go a long way towards making Counterpoint easier to play. Finally, a serious warning: Be very careful with volume levels when playing Counterpoint. It’s almost instinctual to turn up the volume when we can’t hear something clearly, and there are times when you’ll feel the urge to increase the volume of your speakers or headphones to “better” hear the mix. Don’t . It won’t help you tease out individual tracks; it will just damage your hearing. With that in mind, if you’re a big music fan like I am, give Counterpoint a try—alone or with a group of friends—and see how well you really know your music. I’m up to Level 20—and, I have to admit, getting a bit of a headache. 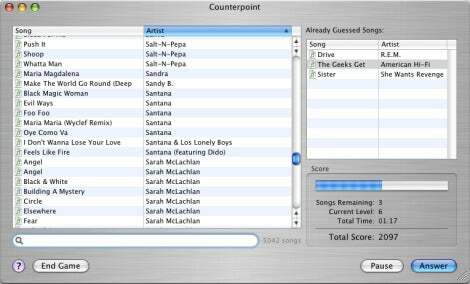 Counterpoint 1.1 requires Mac OS X 10.4 (Tiger) or later and is a Universal Binary.